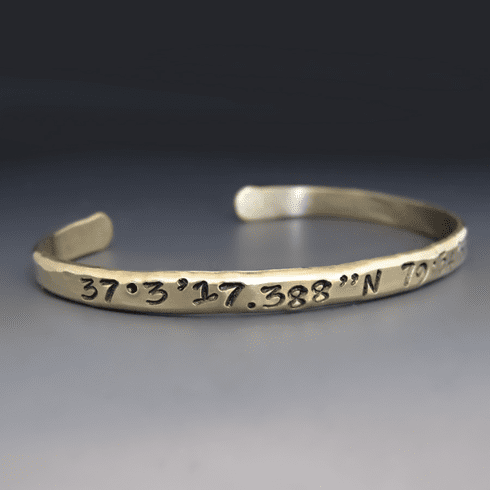 Create a custom meaningful gift with this hand stamped longitude and latitude cuff bracelet. This stacking cuff can be personalized on the inside OR the outside with ONE set of coordinates. These thin stacking cuffs are perfect for those who have more active lifestyles. The minimalistic style goes great with your fit-bit, watch or other gear. This cuff is is 4 - 5 mm wide and made with 6 gauge wire. I do not coat my jewelry with any lacquer or other chemicals. The natural copper and brass, after prolonged contact with skin, soaps and/or lotions, can turn green or bluish-green, and stain the skin in the process. The reaction varies according to an individual's body chemistry, The discoloration is not harmful to one's health, and is readily washed off with soap and water. You can clean the bracelet by either washing it with soap and water, wiping it with rubbing alcohol or with a jewelry polishing cloth. 'Penny Bright" is also a great and easy product to clean your copper jewelry and can be found in most grocery stores.